While the total amount of shared DNA in centimorgans (cMs) is a fine indicator for your closest relatives out to second cousins, farther relationships can be more and more random in the amount of shared DNA. 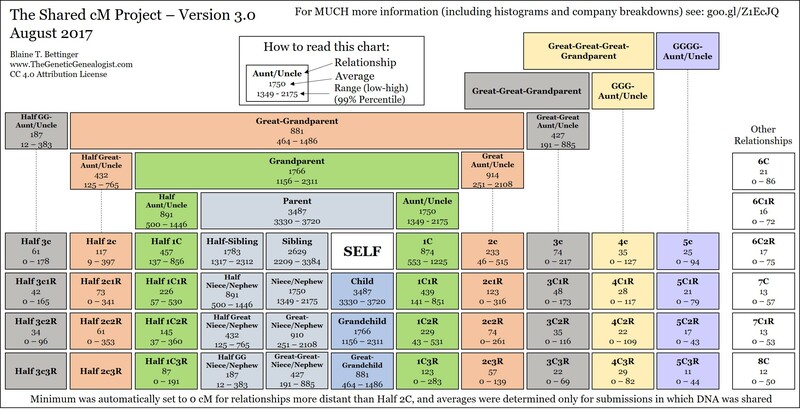 You can consult the charts and numbers at ISOGG here – http://www.isogg.org/wiki/Autosomal_DNA_statistics – to determine those closer relatives. Note that since you share about 25% with an aunt, uncle, grandparent, grandchild or half sibling the amount shared cannot tell those relatives apart [UPDATE 20 Oct 2017: See my study results showing that paternal half siblings can be told from the others here http://blog.kittycooper.com/2017/09/the-25-relationship-a-first-look-at-the-data/ ]. Sometimes the X can help distinguish those, see my post on that here. Frankly the testing companies are not that accurate in predicting your more distant relationships, those past 2nd cousins. So when deciding which DNA matches to pursue, follow up on the ones with more than one large segment; those are your closer relatives, the ones whose trees may be easier to connect to yours. With my two successful matches, or matches with whom I found a connection, I know how unpredictable the size can be. And recently, after having a lot of cousins tested and two of them are 2nd cousins to each other and they share the largest segment 40.4cM, total 157cM, to me was a good indicator on what 2nd cousins should be sharing, more or less. Since I get pages and pages of 2nd cousins, if not predicted closer (FTDNA), it was good to go by this. My mother has had a 50cM largest segment match (total 122cM) and knew that this had to have been a close match. Took me over 7 months to figure that out (actually 11 straight days of non-stop research) to find out that my mother and this match are 1/2 third cousins. Pretty distant in a way, but that 50cM is pretty large. The next largest segment is 38cM. My mother gave my brother basically that same largest segment whereas I got only 14cM of that same exact segment. I actually share 28cM of that 2nd largest segment, but had I not got my mother DNA tested (I tested first) I wouldn’t have paid attention to that match, and actually I didn’t until almost a year after my mother tested. Definitely from 2nd cousins on it can be unpredictable. Very interesting, I am new to Genetic Genealogy, I have been researching my ancestry for a long time, but I am going in circles on one DNA match. I definitely feel having my cousins test themselves and adding their DNA is a great way to discount possibilities. My dad’s first cousin has a 688cM across 37 segments match to me. This is very high. Always felt I was strongly linked to my dad’s side. I have 4 sisters from an unknown family who link with me ranging from 46cM-31cMand a shared link with us who shares 110cM’s over 7 Segments with me. They cannot link this person, I cannot yet link this person. We can’t find any common link, but I have no idea who my nan’s father could be. I do know the closer of these links had relatives in the correct Geographical Area in the correct year for my nan’s birth, but that could be wishful thinking!! Time and more relatives testing will tell! Yes test as many relatives as you can, particularly older ones. That 688 is high but within range. The 31-46 group is low, anything from a 4th-8th or even further. I tend to work only on matches of 100cm or more to start with as the others are often too far back to find. Hi, I would be interested to hear if you have made any progress on this- I also have a 1st cousin of my dad with a match in the range you indicate- we share 698 cM and 32 segments. Kitty, a great post – and thanks for the plug. My true brother and I have such a mish-mash of DNA, that the Admixture/Ethnicity programs look like we are not related! DNA is random and very variable. Kitty – Great post. I’m so glad you like the chart! I’m still working on the Shared cM Project, there’s so much still to do, stay tuned! And I agree, Jim’s blog must be added to everyone’s must-read list! I am trying to understand the significance between “Total Segments” and “Largest Segments” on Gedmatch. If you have let’s say, 8 matching segments with someone, and the largest segment is maybe 4 or 5cM, and the total of all segments is maybe 17cM, is that of significance when trying to find a common ancestor down the line? I guess I’m confused with terminology because I keep reading in many places that matches over 10cM are pretty good ones, but I don’t know if this means 10cm on one segment alone or a total of multiple segments. In your example the segments are too small for the relationship to likely be findable. If there is no endogamy in your tree then anyone who matches you on multiple segments of 7cM or larger is worth following up on. Segments smaller than that are often false, below 5cM they are false more often than true. Kitty, thanks so much for giving me a better insight on this. So basically if I match with someone and all we share is just one segment well under 7cM, it is highly probable of being a false positive, but if I match someone and we have several segments that come to an overall total over 7cM, that person would be worthy of further investigation. Did I get that right? Gotcha! Thanks again for the help! Hi, you seem to know so much . Can i ask you, i just found out a woman is a 745cm across 40 segments to me. Could she be an aunt? She told me she was adopted and does not know who her real father is? I am more or less the kit Admin for my adopted Japanese daughter in law. I noticed two of her matches, a mother and daughter have a lot of small segments. The mother daughter pair are probably 3c1r and 4th cousin. The daughter has the most looking at 3cm she has 130 cM total, other 4th cousins have maybe 30 to 40 cM some a little more. Does this mean anything? I was thinking maybe they are a little closer than they appear? Small segments can be population specific. We tend to only look at matching segments greater than 7cM and total those. Also large segments greater than 20cM are indicative of a closer relationship not lots of little segments. Look at the numbers here after you total the larger segments. Also if the daughter has matching segments that the mother does not, they would come from her father. Matching on both sides like that can make a relationship look closer than it is. Sorry for the follow up, does that mean this person (a female) is related to me on my mothers side for sure, since its ONLY the X ? Ok great, thanks! GEDmatch is awesome! trying to figure out the relationship ..she said its her moms side of the family and she is the half sister and her brother gave a baby girl up for adoption ?? Deanna – I am not sure what you are asking. That is on the low side, but the DNA match could be a half-niece relationship. If you are an adoptee or she is, then I recommend the DNAadoption.com web site plus join their mailing list at yahoo and ask questions there. Or DNA detectives on facebook. she also shares 187.2, 6 segments (chr 5,6,7,9,14), longest 78.4 (chr 9) and (chr 14 at 41.5 and 15.3) plus 26 “X” cMs with another male match. Any significance in 2 long segments within one chr? Mom’s 187 match thinks it’s possible his great Uncle or a 1/2 great Uncle may be my Mom’s great grandfather. Which means they would share a 2nd great grandparent. I’m having trouble with this because they share more DNA than 3rd cousin level? Thank you! Hi Kitty, I am trying to find my Ashkenazi father. This is one of my closest matches from his side from Gedmatch. Any insight on what type of relationship this is with the endogamous component. Trying to decide if it is worth proceeding with, what do you think? Thank you so much for considering. 397067 SNPs used for this comparison. Definitely worth pursing that match, about a 3rd cousin, 2C1R, 3C1R, 4th …. the large segment is promising for a closer match. Sorry Wendy, I seem to have missed your comment. 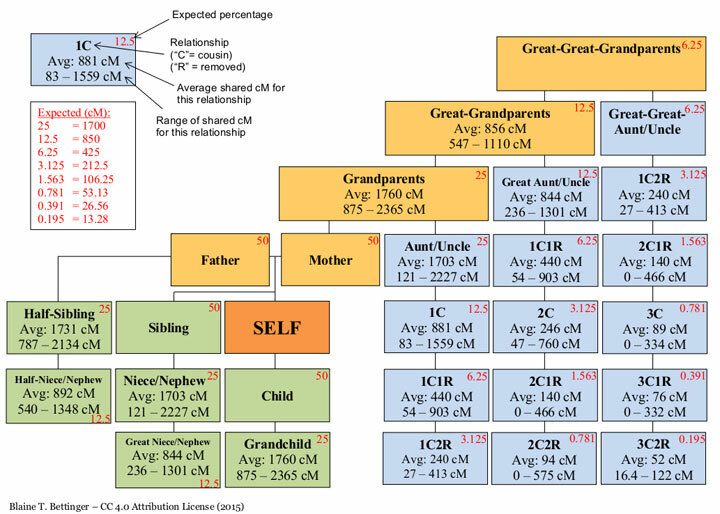 a large segment like that is usually closer family 3rd cousin or closer but it is the total cM which we use to estimate the relationship as in the chart shown above. Hi, i cannot find the segment lengths from my testing company. I surprisingly matched to several members of a family I do not know. They range from less than 400 cM to around 175cM, over 12 but under 20 segments. Is there any way that this possibly is IBS? I did this for med info and ethnicity for fun, this matching was a total shock. Please advise. BTW, Do you do consults? Kind of…..bowled over. Thank you for your article. It has been one of the most helpful in trying to understand smaller segments and their possible significance or non-significance. I understand that if there are a small number of matching segments, there is little chance of relationship. If there is a segment that is over 7 cMs and it is accompanied by a small number of matching segments, it may or may not support the indication of relationship. My question is, because I have a number of matches where this is true, I will have a match with someone where the total of matching segments (using the 7 cM default) is over 25 cMs, even up to 60, and those matches are accompanied by a large number of segments (20 to 30) which are smaller giving a total number of shared cMs between 60 and 100. Do those smaller segments support the relationship? Do they indicate a closer relationship? Does paying attention to the chromosome where the segments are found help to understand? (For example, on the 8th chromosome there are 5 segments which add up to 12 cMs)? My advice is to ignore most of the smaller segments below 7cM and use the total of the larger segments with the chart to make a guesstimate of the relationship. Sometimes the 6s and even the 5s can be valid and triangulate with other relatives but for the most part they are false. Having many of the smaller segments will often occur when you are from the same population group so likely you have shared ancestors many hundreds of years ago, further back than the records. That is all a plethora of small segments might indicate. Not relevant to the closeness of your relationship. Largest segment	82.8 cM Is This a match worth contacting etc. I am an adoptee searching for my birthfather. I am reposting an issue of mine, to get an expert opinion (analysis) from someone on this Blog who maybe an expert on small segments. I’ve read there is a lot of debate on the topic and is usually negative. I’ve read ISOGG and Blaine Bettinger’s blog and others. There is an issue, where on a surname line came from the same small town as my same surname line came from. I really thought we were related as 4th to 5th cousins. Ancestry match results bottom’s out at 6 cM. With the background on my line, some of the matches with my surname, I would say the cM’s shared were really low in that my grandfather and my great-great grandfather did not pass much shared DNA down to me according to a chart, ‘DNA Detectives Autosomal Statistics Chart’ and other online statistics charts. I was wondering to myself, how would I match to 4th to 5th cousins, or have the same common 4x great grandparents. All three of us have common, somewhat overlapping segments on Chr. 5 and 16 with somewhat strong SNP’s, with at least 4 cM not 3cM’s. Even my niece’s less than 4 cM’s results, hung in there with Chr.16 with rather large SNP’s. In some study on small segments that quote, “When utilizing small segments, I generally don’t drop the SNP threshold below 500”. SNPs are larger than 500. My ancestor did change his first name when he came to America on the boat, but there are documents such as parish/church records from here and in Germany. Why he changed his name, not sure why, but it could be a confirmation name which are not documented in parish records in Germany. This is way too complicated for a quick answer on my blog but yes this could be valid, especially with a large number of SNPs. Test more cousins on each line to try to confirm. Oldest generations best. Small matches in cM of 4-6 with high SNPs are possibly valid if they triangulate but beware, these can also be population segments. Look at who else matches you there. This seems high for a 2nd cousin. I know who it is, we thought we were 1/2 first cousins. Isn’t this more within a 1st cousin range? Thanks! That looks fine for half first cousins, a little on the high side but DNA is pretty variable. It could also be full first cousins as you suggest. Another possibility is that the parents who are not expected to be the same are related. Any endogamy in that tree? You can confirm the full versus half by testing 2nd or 3rd cousins or other close relatives that you expect NOT to be related to both of you. If they are only related to the expected person, that would confirm the halfness. If they are related to both, but very unequally, it could be the related issue. So you may need to test even more people. That size is more likely to be a good match than a false one. GED states that a good match has to be at least 700 SNP and 7 cM. Would that be true even if the numbers were close? GEDmatch is basing that guideline on the article I gave you the link to. Your match is about 50% to be a good one but is likely to be pretty far back in time. Awesome. Thanks so much. Its pretty exciting to me. My ancestors were traded, so having a match from the continent is very amazing. I understand it will be very distant though. I will be testing much older relatives to see if they have the same match too. Four of us sharing a very rare Irish surname amongst known ancestors have been lucky enough to separately stumble upon each other during Internet searches during the past several years. From family histories and records, we all knew we had rare surname ancestors coming from the same small area in County Mayo, Ireland dating to early through mid-1800’s. Based solely on family histories, we wondered if all four of us might have the same great-great-great grandparents or great-great-great uncles/aunts. This month, we all posted our DNA test results at GEDmatch to see how or if we match. The results are a mixed bag. For one person (I’ll call “Judy”) for whom I suspected (before DNA testing and from family history) her known great-great-grandparents might also be my “lost” great-great-grandparents, the GEDmatch 3D Browser showed that she and I matched on 14 different chromosomes and a total of 27 segments, for a total shared cM of 77.5. However, all 27 segment values are on the low side, with the highest being 5.2 cM. The others were: 3 segments between 4.0 and 4.9, 17 segments between 3.0 and 3.9, and the rest less than 3.0. So, lots of Crs, segments, and total cM but very modest segment values. For this same “Judy” person, another one of the four of us showed a match at or above 3.0 on only 8 different chromosomes and 9 segments, totaling to 35.0 cM but with the highest segment at 9.1. So, a higher highest value than mine….but on much fewer Cr’s and segments. Does the fact that I match on many more Cr’s and segments, but with a lower highest value on a single segment (5.2 cM vs. 9.1 cM) imply any greater probability of a 5 or 6 generation common ancestry to “Judy”? Matches below 7cM are often false which is why we look at the total of segments > 7cM. Your matches are too small to be conclusive. For a rare surname the best strategy is to test the Y of the men with that surname, at least 37 markers. At family tree DNA (use my link in the footer so I get a little credit). This reaches back many hundreds of years, much further than autosomal which is not guaranteed to produce matches beyond 3rd cousins …. Also please note that those 37 marker Y DNA tests are on sale until father’s day! The ancestry result suggests she is a half niece, that is to say her parent that is your sibling is likely a half sibling. So did either of you actually test at MyHeritage or did you upload your results from ancestry? The same company and chip? I would contact customer support at MyHeritage as that seems too large a difference. mskitty I uploaded my data from ancesterydna to MyHeritage, my niece match relatives on my maternal side of the family. I am assuming her father and I are half sibling. My brother is having a hard time with this since I am name after our father. Who is decease. Thank you for your reply! These situations are always hard and often a shock. You might both read the story of how DNA affected a genealogist and newsman when he learned his Dad was not his biological father – The Stranger in My Genes by Bill Griffeth. Thanks Kitty, your comments and reply has been quite helpful! I will read – The Stranger in My Genes by Bill Griffeth. Our family is trying to solve a brick wall. I am using the Blaine T. Bettinger chart which was updated March 20, 2017, and goes out to 8C. Cindi (my 1C1R) and I have both tested with Ancestry. We both match Tina, me at 56.7 cM over 1 DNA segment, and Cindi at 37.8 cM over 1 DNA segment. Using the Bettinger chart, I figure that Tina is my 4C1R, because it seems that we share too much DNA for it to be a relationship which is further away. Notably, my sister Kim has 0 DNA in common with Tina. It seems to me that 56.7 cM is a fairly large chunk of DNA, but I don’t understand the implications of it being over 1 segment, as opposed to, for example, 3. After 3rd cousins the amount of DNA shared cannot be accurately determined. The chart is just a set of estimates. Because your matching chunks are so large, a 4th/5th cousin is probable, but by no means for sure. Hi Kitty! I hope you can answer this for me! I was adopted and recently did a DNA test on Ancestry, many surprises in my ethnic background, however I am more curious about a match who came up as a first cousin, I am thinking she may be my half-niece. We share 947 centimorgans over 45 DNA segments. Her sister, who has a different father than her had a lower match 639 centimorgans over 32 DNA segments. Is this at all possible? I ask about the niece match because her uncle and I have spoken often and his father matches almost exact what I was told about my bio dad and the ethnicity matches as well. Thanks in advance for your help! Sorry, if you match both sisters then you are related to their shared parent, the mother. Both matches are within the range for a half-niece or a full first cousin. Are they sure they are half sisters? Yes, they have the same mom, but different fathers. This is all so strange and confusing for me! Thanks for your reply! I’m just starting with all this, and it’s like learning a whole new language! I’m sorry if my questions seem rather simple. I tested with 23andMe, uploaded to all the usual spots. I’ve got my Ancestry test pending. Trying to find biological family. So, when I look at these comparisons, what is the most important thing to be looking for, length of segments or number of segments? I have one who we share 36 cM on one, with 2 other, smaller segments. Also, I’ve found 2 other people who share almost the identical segments with me and the first person. Would that indicate that the 4 of us share a common ancestor? Also, I have another person who shares 46.6cM on a different chromosome, but only that one segment. Are any of these significant? Thanks for any help you can give. Yes it is a whole new language. Please have a look at the methodology at DNAadoption.com then join their mailing list and join DNA detectives on Facebook. Lurk and learn. Maybe take a class at DNAadition. I just solved another case this way, 4 days after her Ancestry results were in (but it was an unknown dad only). I plan to make an adoption summary page here soon. But if they have trees, collect them, they may be useful as you get more matches. Great article! I have a known second cousin who tested at FTDNA. We did not match, but he matched my grandmother who is his dad’s first cousin. When I uploaded our results to gedmatch, we only matched on one segment at 13cms (he matched my grandmother at about 300cms). The predicted relationship was 5th -8th cousins! I really expected us to have a higher amount of shared DNA because everyone else in my family who tested matched him pretty high. If I didn’t know our MRCA, I would have discounted it as being really distant. Your information is quite helpful to me, but I am having a problem identifying cm numbers which are relevant for me. My mother was adopted and I am searching for her family. I have tested on both Ancestry and FTDNA and find the cm matching counts to be so different. I have quite a few matches who have also tested on both and the results can vary significantly. They difference can range from 10 cm on Ancestry to 60 cm on FTDNA and other similar differences. When there are not many very high matches for me to pursue, I would like to know which testing company’s results are the most helpful for my purposes. Thanks for your help. Ancestry removes matching segments which are population specific or pile ups. this is very helpful for those from endogamous populations like Ashkenazi Jews but does result in a smaller total. family tree DNA includes many small segments which can sometimes be useful, but results in a higher total. These are both within the range for a first cousin to you two but too high for a first cousin once removed which is what your father’s cousin would be. Could this cousin’s parent be your father’s sibling? A within family adoption? Are any of your father’s generation alive and willing to test? Kitty, thank you for your very helpful reply. This cousin of my dad’s has a brother and sister still living, but I’m not sure if I can convince them to do a test…..I might have more luck with her son. I haven’t even considered telling them that their much loved father might have done the unthinkable, even if I was absolutely certain. There are no others left of that generation. I don’t believe she was dad’s sister, she’s the middle child of my great uncle and his wife, and he and my grandmother and their sister were no longer on speaking terms by then. Sorry about all the details, but I am trying to be very thorough. I did suspect this a while ago and the DNA results are beginning to look like confirmation. I appreciate your help, it’s a relief to be able to ask an expert questions. My mum shares 342 cM over 13 segments with a man only on Ancestry who won’t share their tree – help ! * and with a great grandfather to find we think it is THAT crucial line. What to do ?! Could his great grandfather or great uncle, or grandfather or uncle be my mums grandfather ? Correction – I meant ” * and with a grandfather (of my mother’s) to discover we think it IS THAT crucial line. What to do ?! Could his great grandfather or great uncle, OR grandfather or uncle be my mum’s grandfather ? All advice very welcomed. The 3 shared matches don’t match each other and are very small cM. I thought I found my (half) brother’s grandchild. The results show there are only about 545 cm shared between them. I share 632 cm with this child. Is this possible or should I be looking a generation back for answers. If you share more DNA with this person than your half brother then it is almost surely not his grandchild. 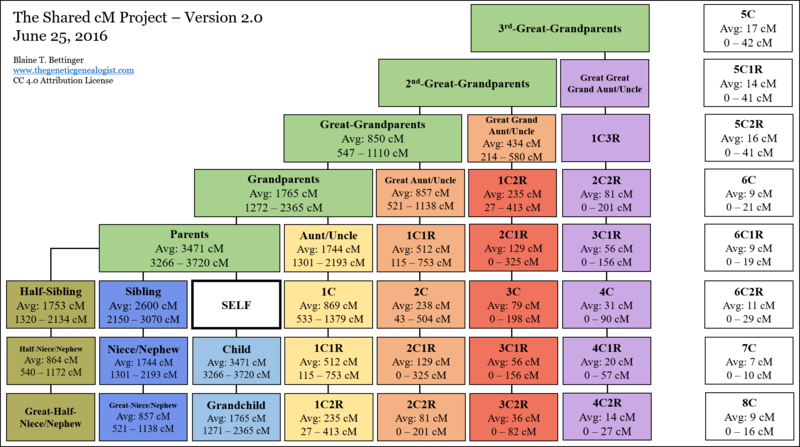 Any DNA his grandchild has in common with you would be from your half brother unless you are from an endogamous (very intermarried) population. Another possibility would be if that person is somewhat related to your other parent. Hi Ms kitty, Thanks so much for having this blog. I am very new to the world of DNA and adopted with no information on my biological family but I am reading as much as I can. DNAadoption has a lot of good information. I did my DNA with FTDNA first then Ancestry. I did upload my data on Gedmatch. On FTDNA my first match I share 104 cM, total cM is 85.78. We have plenty In Common With also. Are the numbers I share with my first match a good start or are the numbers on the lower side if I wanted to research the matches we have in common? Hope that all makes sense. That match is a start but not the 2nd cousin match or better you would hope for, since 106 is only about a 3rd cousin or 2nd once removed. Still with enough of those matches, you can find your biological family but it won’t happen overnight. I completed an AncestryDNA test. I shows I have a close relative. We share 1,656 centimorgans across 64 segments. What is your take on what their relation may be to me? Hi. My wife also completed an AncestryDNA test. It shows she shares 1,788 centimorgans across 78 segments with a woman. She contacted the woman and it turns out the woman is adopted with a half-sister. This woman and her half-sister share 1723 centimorgans across 76 segments. Does this mean my wife is most likely a half-sister to this woman? These matches fall in the half sibling range. The other possibilities are grandparent (usually ruled out by ages) and aunt/uncle or niece/nephew. If you can compare them at GEDmatch you can perhaps tell them apart. Thanks Kitty! We are doing GEDMatch right now and may have some follow-up questions. Good night. Could a 545 CM match be a half 1st cousin? Hi. I took the Ancestry DNA test and a woman showed up as a 1st-2nd Cousin. Although she’s predicted to be a 2nd Cousin. It says we have 406 centimorgans shared across 25 DNA segments. I don’t know this woman and her alleged parents and grandparents or great-grandparents are not related to me. I’ve have researched my genealogy for over 15 years and her alleged family doesn’t appear anywhere on our tree. What are your thoughts? The most likely relationship is 1st cousin once removed or half first cousin or second cousin. There are many possibilities along those lines. As to how this could be, she might be adopted and that is her adopted family’s tree. She might not know she is adopted. Or you or she could have an unexpected paternity event (NPE) where one of your grandads or great grandads is not the name on the birth certificate. What is your age difference? Then contact your new relative and work on this together. Thank you! And thanks for replying. She and I are the exact same age and she curiously resembles my own mother (I saw a FB photo). Btw, she’s related on my mother’s side of the family. My mother’s FATHER side. I thought perhaps she was one of my mother’s brothers NPE children. Or perhaps even my grandfather’s NPE child. But now that you’ve mentioned once-removed I do wonder if she’s one of my mother’s first cousins’ NPE daughter. She also shows up as an exact 2nd Cousin for my nephew. They have 258 centimorgans shared across 15 DNA segments. Is there anything like this for large X matches. I working on a match that share 138 cM on the X but only about 8 cM autosomal. Any ideas? There is one other match that has 58 cM of the same segment. X matches are much more variable than autosomal matches because the X passes through males without recombination. So no they cannot be predicted. Since a small autosomal match is included, my guess would be a 3rd cousin or 3rd once removed. Kitty, I have a general question for you. My DNA show 100% European and I have some really good matches, many of whom I’ve been able to confirm. My husband has 66% Native American ancestry. I noticed that my closer matches are much lower total cM matches, but larger segments. His closer matches can be MUCH bigger in terms of overall cM, but the segments are usually quite small. Is that something to do with the gene pool? I’m Heinz 57 from many countries and his ancestry from both parents is from a small area in one country. Likely his closer looking matches are not as close as the total cMs indicate. If they are all from one area, there could be cousin marriages affecting the amount of shared DNA. Also small segments can be population specific as opposed to recent common relatives. Your close family out to about 3rd cousins will share larger chunks. Also do not use the totals from your testing company, best to total all the segments > 7cM yourselves. Anestry totals are OK but upload the data to GEDmatch to see the segment sizes. I wouldn’t trust Ancestry. I used ftdna and then uploaded to gedmatch. I’ll used the >7cM rule on his and see what it looks like. I was pretty sure that the smaller area and possible cousin marriages would affect results, but I wanted an expert opinion. Thanks so much for your blog and for the very fast reply. Much appreciated! The default at GEDmatch is > 7cM so that is easiest and best! All other things being equal and assuming no endogamy, can you give us a generalization regarding the interpretation of a situation where you have 2 12 cM segments vs a single 24 cm segment? How would chromosome location factor in, e.g 2 locations on same chromosome vs 2 different chromosomes? I am concerned about probability vs “magic thinking”. Glad to hear that. One of my ‘hooks’ to encourage AncestryDNA matches who share multiple segments to post their kit to gedmatch is the possibility of finding two sets of MRCAs for the price of 1 (especially when the shared matches showing in Ancestry are mixed between 2 diff lines – I code all matches based on their matches). But, as the number of shared segments > 7 cM increases, does that not undermine the assumption of independence, statistically speaking, because of proximity and the likelihood they came from the same line generally speaking? It just depends on how small a population pool those ancestors had as to how likely it is that two segments = two MRCAs. I start with the assumption that it might really be a 4th cousin match or so with one MRCA. Thank you for taking the time to talk about this while I struggle to ‘debug’ my thinking. Because I come from mostly early colonial era in the US except for one line that got here in 1840, I am very used to seeing my ancestors in random trees all over the place so it wouldn’t surprise me to have 2 sets of MRCAs for 2 segs, but I am struggling with “magic thinking” — always a problem when working with probablilties. I must imagine that the closer the match AOTBE the more likely the segments came from the same line in my tree but with different possible MRCAs in that line but that a couple of smaller segments for a match who shares less cm could have come from 2 different lines and MRCAs as they get further back in time where there are many more degrees of freedom. But, then I imagine that it’s not necessarily as independent in the statistical sense to the degree that the multiple sets of MRCAs are coming from the same area/ Does that make sense? Similarly for the case where the two segments are on the same chromosome. DNA inheritance is too random past 2nd/3rd cousins to apply much math. Large segments are good and tend to be from more recent ancestors. Single segments are less likely to be findable than two large segments. However as we said, two can be from different lines so just as hard to find. When your ancestors intermarried it gets more difficult to figure these out. Kitty, thank you so much for taking time to discuss this with me. Regarding starting with closer matches, I completely agree but on my mom’s kit I’ve solved as many as I knew personally and most who posted to gedmatch or had kits where a chromosome browser was at hand, but since I only had the kit for her, I’ve been testing this approach: made a master spreadsheet of all her matches using gedmatch Matching Segs: then decomposed them in to two groups for every discreet group (no overlap); then based on who was in the segment, classified them as maternal or paternal when I could based on trees or the fact that I could reliably identify the other segment with that address range. where there was no overlap I provisionally marked it as a potential recombination and/or crossover point until/unless an overlapping match turned up. Then I set about classifying segments based on the big cousins where I could. I tried Visual Phasing in the cases where segments were big enough. I used triangulation to test my assumptions. I used logic to interpolate as many big cousins from 23andme and ftdna who had not posted to gedmatch. 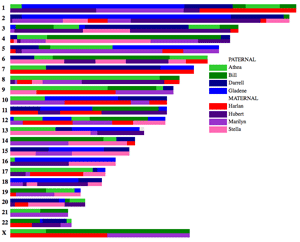 I also use a system coding ancestry matches based on who they match even where the line was unknown when necessary (e.g. “mystery cluster z”). My biggest takeaways from my approach were as follows (1) how often I would have been wrong relying on Ancestry without segment matching, (2) how interconnected those of us with deep US southern early colonial era ancestry are and (3) the hell of Scottish pedigress 🙂 ….BUT my biggest challenge has been the problem of “magic thinking” regarding probability SO THANK YOU FOR YOUR PATIENCE AND WISDOM! Hi, what in the world does this mean? This is my first and biggest hit, he’s a white dude in Virginia, I was born in Mexico. That is a nice close match, perhaps a first cousin or half uncle, what are your relative ages? Where did you test? Did you think you knew all your bio relatives? Forget about that white thing, we are all human and all mixed, mexicans often more so than many! Kitty, Thanks for the great information. I have someone who matches my fiancé for one segment of around 27 centimorgans on chromosome 16 and a couple of other segments on two others. She has six segments of around 3.5-4 centimorgans on the X. Given she is a match on other chromosomes of over 7 would several smaller segments on the X indicate an X match? Thanks Kitty. I appreciate you answering the question. I assumed this was probably the case but wanted to check. Hi Kitty – Thanks for this information. Question. I have at least 12 DNA matches to both me, my aunt and uncle and all of these matches are of the same surname. Because we are related to these matches 7-9 generations (according to Gedmatch) back I reduced my Gedmatch search to 3 cMs and 300 SNPs. Total segments in common vary among our 12 matches anywhere from 23 to 6. Total shared cMs range from 96.5 to 21 cMs. Would you say this was indicative of a shared ancestry? I would not reduce it that far. I use 5cM and 400 SNPs when lowering thresholds for known family. But the segments are still likely to be false if the SNP count is low. However from what you are saying this is a set of matches worth pursuing which may well include a common ancestor. Warning, if they are from a group that has intermarried alot, then this could be misleading. I am adopted and I entered my DNA in ancestry.com. Eventually, by matching basic DNA data from ancestry with two relatives (who turned out to be a cousin and half-sibling) I was able to determine the identity of my birth mother. I was able to conclusively do this by using other information, such as ages, time periods, and non-identifying information from the adoption agency. Now I think I have found the family, generally, of my birth father, But I don’t have any of the additional historical information to augment my search, One relative on my father’s side registers 1,767 cM across 50 DNA segments, Another registers 999 cM across 40 DNA segments. I haven’t yet been able to convince either to go through GedMatch. I’m assuming the first is a half-sibling and the second is a first cousin. Is there any way besides comparing downloaded data to make a conclusive determination? One thing that confuses me is that in the case of two half-siblings on my mother’s side we shared 60 DNA segments exactly, but in the case of the one relative on my father’s side who registered 1,767 cM we share only 50 DNA segments. Shouldn’t half-siblings, whether they come from one side or the other, share the same number of DNA segments with me? Actually there is less recombination done on DNA inherited from a Dad, so they are usually different and less segments is normal. Try convincing them to upload to family tree DNA if they are concerned about GEDmatch, there is more privacy there. Only people who match you can see your results. Hi. I’m following a line that comes from the Azores so endogamy is confusing me. The lines starts a while ago so any DNA match to do with that line will be 3rd or 4th cousins. Would a match that shares 50Cm on one segment be better to follow than a match that shares a total of 50Cm across 4 segments? More large segments is best. Single segment matches can be very far back in time, even large ones like that one. I would prefer a match with 50cM on 2 or 3 segments but 4 is good too. An old post but very good. On my GEDMatch I have 2 matches where I am curious and have a question regarding. One is a match that shares 214 cM total with the longest being over 39cM… what level of relation would that hypothetically be? The other only shares a total of 53.7 cM however I only have one segment of 53.7 cM in length that I share with them. Is there a reason that we would share a segment so large, but it only be one segment? Would that be a relation worth looking into? The 214 is likely about a 2nd cousin. The single large segment can be anything from a 4th to an 8th cousin. Segments can last for a surprisingly long time and the further away the relationship the wider the range of shared DNA. I find that single segment matches are often too far back to find so look at other matches first. Hi my brother did an ancestry DNA test and was matched 1557cm across 57 segments to someone . I don’t fully understand this and now my whole family is in turmoil as he is insistant that the person who is matched with us /him is our older half sibling. This person has found their birth mother who actually named my father’s uncle as the person’s father. Please could you explain what all this means and would my brother be matched this way if the person NOT my fathers child? DNA does not lie. With that amount shared this match likely really is your half sibling. One other possibility is that this person’s mother is also a relative of yours so the match shares DNA from both sides. In that case the uncle could be the father. But DNA is more reliable than a birth mother’s statement. Tell your brother he can send me more information via my contact form (like GEDmatch kit numbers) if he wants more proof/evidence. Take a deep breath and welcome your new relative into your lives. Thank you Kitty I think you are right …. I had my DNA done. One of my dads sisters; my (aunt) came up as my cousin. How is this possible the cm 1015 the segment was 37. I asked her about she said no honey I am your aunt. The number don’t line up. I just had my DNA tested and I matched one person with 403 centimorgans across 23 segments of DNA, what does that translate to? I match someone at 64 cMs on one segment and we can’t find anyone in common on our trees. Do you think this could be a link to an unknown 2nd G Grandfather? How many segments? Which company? Perhaps the most likely is a grandchild of a sibling of your mother (1at cousin once removed) but there are others. What is the age difference between you? Have you been in touch? DNAadoption.com has much help, they advise making a copy of the person’s tree before contact and not mentioning adoption right away. I’m a frequent visitor, but its my first time posting.I had a question regarding segments. I had my mother take a DNA test early last year on Ancestry (later uploaded to FTDNA and GedMatch) in hopes that I could find more about her maternal grandfather who was unknown to us. I have isolated several extremely high matches of 100-298 CM’s tracing back to a particular couple with a name and location that does not match any of her relatives for her father or her known maternal lines. This makes me think that the DNA is from the unknown line. This couple in question had 3 sons, and she shares almost 300 CM with descendants of 2 of them. I realize that 300 CM could ether be a half 1st cousin 1x removed or a 2nd cousin, but I’m wondering if the shared Segments could offer a clue as to which is the closer relative? One she shares 298 over 10 Segments, the other 295 over 14. Is there any way to know? I am hoping someone with a better understanding of the subject can help. I thank you very much for your time. Exciting, if the dates work then that couple could be her great grandparents. Yes those would seem to be second cousin matches. Or possibly the husband is unknown grandad (half1C1/2R)? Are there matches further up the tree for both members of the couple? I recommend getting in touch with these cousins and explaining your search and getting more members of that family tested. Also if you are tested at ancestry, if you all upload to GEDMatch then look at the X matches for these relatives if any are descended from daughters of those sons. First of all, I can only imagine how dedicated you must be to this research to take the time to respond to each post. I am beyond grateful to have found you!! I am an adoptee with no biological information of either parent. I do have a surname and a city of birth but beyond that nothing. I have tested on ancestry and 23andme and have loaded results to gedmatch. The highest connection I have established shares 187 cm over 12 segments…3rd cousin possibly ?? ( I have several matches with similar amounts of shared DNA) woyld you please direct me toward any ecplprations that might be helpful in my pursuit of self discovery. Prior to DNA testing, I had no knowledge of my heritage. I am biracial. This journey is very important to me (and emotional for me) I have children who are just as curious about who they are biologically as I am about myself. What is your suggestion for someone like myself who has no foundation to build from? Is there hope? Anything you can offer would be appreciated beyond measure. Again, thank you. I recently did a DNA test and was matched with someone I do not know. It says she is a 1st cousin to me. We share 1,262 centimorgans across 40 DNA segments. That’s pretty high. I contacted her and she was adopted, so she doesn’t know who her father is. She has her mother’s name, but it’s pretty generic and I can’t find her. I have ruled out my maternal side because she has no Italian heritage and they are largely Italian. It must be my father’s side. Given her age, I am thinking my grandfather or great-grandfather would be her father. Do the centimorgans support that theory and I am way off base in thinking that? I share 517cm over 26 segments. This person is 81 years old and I am 48 years old. Would 1st cousin once removed be the most accurate relationship? I have looked at the charts and I don’t think Great-Great Uncle or any of the possibilities match up. I have a specific question. I have a match that has one 70 CM segment and a second smaller one. So far we cannot find the MRCA through trees, though we know which side the match is on, and which town our families immigrated from (the town is the same). So, what does is mean that the segment is so large? A large segment usually means a closer family match but even very large segments can last a surprisingly long time. DNA recombination is very random so this match can be anything from a 4th to an 8th cousin. Or related more than once. Do other of your family members have this match? I always thought my great grandmother was Ashkenazi Jewish and when my daughter took the DNA test, it showed that she was Ashkenzi Jewish. However, when I took the DNA test, there was 0% Ashkenazi Jewish in me. Is this possible for it to skip me, and for her to have the Jewish DNA? No it is not possible for it to skip you BUT none of the companies are completely accurate yet as these predictions are an emerging science. Jewish is usually pretty clear in the DNA however, so probably that is from her father. I read your post to Reg about small segment sizes and wonder if a small segment size under 7 can ever be helpful in determining relationship. I have been in contact with 38 individuals who can trace their family name back to a small place in Northern Ireland within a similar time frame. We are trying to determine if there is a relationship between these individuals. Some match others in the group for over 10 cM and some we know are related as 1st, 2nd, 3rd & 5th cousin but many of them match each other for less than 5 cM. How can I use the DNA match from those known cousins to help sort out if the others unknown individuals are a possible cousin. How much DNA would you expect a 5th cousin to possibly share. However if some of those small segments triangulate (are shared in the same spot by at least 3 people) you might go down to 6 or 5.5 cM … but that small is very unreliable, often false. There is no X match. I should also mention this person has also uploaded her mother’s DNA test results on Ancestry (but not Gedcom) and these show the relationship to me as sharing 108cms shared over 5 DNA segments. Her mum is likely to be my generation. Would I be right in thinking it’s entirely possible the chap who is her Great Great Grandfather is likely to also be my ‘Great Great Grandfather’? I would have thought if our MCRA was the 4 x Great Grandfather then the DNA readings would be much weaker. That said, I am only just beginning to get my head around all of this and it’s quite fascinating. I very much look forward to some guidance in this. Many thanks for your response. It certainly helps clarify what I was thinking. I think I’ll get my Dad’s DNA as he is one generation closer and the person I was referring to would be his Great Grandpa. I’ve just come across your blog and am hoping you can help me to better understand my Ancestry DNA results. I’m adopted and I do know the match in question is from my fathers side and not my mother. The match states 1603 centimorgans across 77 segments. I am female, this match is with a male. I also matched with a female who I’ve confirmed to be his niece. My match with her says 648 centimorgans across 39 segments. What I’m unsure of is whether this man is my half-uncle or half-brother. I do not have access to his dna to compare on any other platform so I feel a little lost. Am I correct in believing that this is a half-brother or is his brother my father? … you really cannot tell whether he is a half sibling or an uncle/nephew (if he is your father’s brother he is a full uncle) from the data given by Ancestry. The number of segments is high but the ancestry algorithm sometimes makes 2 segments out of one. You would need to compare somewhere else where you have a chromosome browser, preferably GEDmatch, MyHeritage, or family tree DNA. Then look at the charts in that article. If he is a paternal half sibling you will typically share several segments > 100 cM while an uncle might share just one or none that large. I have a third cousin once removed with whom I share 20.7 centimorgans across 1 DNA segment according my Ancestry DNA test. My daughter shares 29.9 centimorgans across 1 DNA segment with this same cousin according to Ancestry and my brother shares 46. My daughter’s father is not related to me. How is it possible that my daughter shares more centimorgans with this cousin than I do? I would encourage all three of you to upload to Gedmatch and/or family tree DNA to look at the details of these matches in a chromosome browser. I am trying to understand my DNA on Gedmatch as compared to a relative that I believe is my half sister or niece. So…am I correct in thinking that we share a father? Just to be sure I don’t send the wrong info…. I hope this can determine if we share a father or if I’m the aunt. The family said her grandfather had an affair with a much younger woman and a child was born so there is a chance that it could be me. Obviously I’m related, it’s just completing the puzzle that’s been so difficult. Wow, I had that all formatted. Not sure what to say about this mess…. I’ve just had my DNA test from Ancestry and have been matched with a possible second cousin we shared 305cm and 19dna segments. I’m searching for my mothers father she was adopted and father unknown. We do know he was from America and that’s it. From the DNA test we now know he was Native American that explains out skin colour as we are from London and look very Spanish/Mexican. My question is this a good match for a second cousin she has also got English and Native American genes and a possible match to my mothers fathers side? That is a solid 2nd cousin match; it could also be a half first cousin once removed or many similar relationships. What are the relative ages? Thank you for replying I’ve just sent a test off for my mum so just a matter of waiting now. If it is a second cousin match to me what would my mum match to her? The lady I’ve matched to is my sisters age a bit of an age difference to me as my mum had me in her late 30s but definitely my siblings age. The problem is the second cousin is adopted also and does not know her father. We have both been matched to people who have the same surname as her biological mothers side though so hopefully we are matched through her biological mother as it will be easier to search. Thank you but this means nothing to me I’m all new to this and haven’t got a clue what it all means. I get that she would be my mums 1st cousin one removed is she is my 2nd cousin. As we both have Native American come up and that’s what I was testing for I’m guessing she is related to the grandfather I’m looking for but can not work out who my grandfather was as all army records don’t show if any of her family was deployed to England in around 1945 so I’m stuck. It takes time to understand this stuff. I matched on ancestry.com that’s showing either he and I (I’m female) are half-siblings or 1st cousins on my father’s side. He was adopted many years back and he knew who his birth mother was. On his birth certificate she left “father” blank. My dad had 2 brother’s also. This match and I share 1533 centimorgans over 45 segments according to ancestry.com, is ancestry truly reliable in their results as I’ve read mixed reviews. This sounds like my dad because we know his history with women but still unsure. Do you think we are half-siblings? This match recently asked me to take a 23 & Me test, which I said I had no problem with. When I put in the 1533 centimorgans shared and divided it by the suggested 68, he and I would share 22.54% DNA, is that correct? Thank you. Thank you very much for your response. This match to me couldn’t be a nephew to me as he is either my dad’s son or one of my dad’s brother’s sons. At this time in 1951, my dad and my dad’s two brother’s lived under an hour of one another. Could this person that matched me on ancestry as close relative-1st cousin be a 1st cousin to me if he was one of my dad’s brother’s children at 1533 centimorgan’s over 45 segments of DNA? Or would he be my half-sibling? Could we be that level of centimorgans/DNA segments and still be 1st cousins by any chance in your opinion or no? I’ve seen 1st cousins go up to 1330centimorgans but on the chart you show online I see 1st cousins ending at the highest level possible more in the 1550-ish range? By the way I am younger than this match, I am 46 whereas he is 66 but my dad did have children over 4 decades so this really has me wondering. Any other input would be very appreciated. Gosh, thank you so much for that quick response Kitty! So very appreciated. 🙂 Have a good night and thank you again. So we would share great grandparents as second cousins I have asked them questions and found out their grandmother had no siblings so I have narrowed it down to my grandfather being one of there grandfathers brothers. This is where I’m stuck as all the brothers were in the army all born around the right time and I just can not find out which one came over to (London) England with the army I’ve searched and searched. My mother was a GI baby like thousands so I’m not holding my breath in finding him. The DNA has shown we have Native American/Mexican so I know he was definitely of this origin. Congrats on finding your father’s family. I assume the ethnicity matches them? Now you need to find descendants of each brother and have them do a DNA test. Thank you I have uploaded to gedmatch but it makes absolutely no sense to me at all. Yes the ethnicity matches but I’m struggling to find descendants of each brother. All of them are my second cousin matches and are matched as first cousins to each other I’ve also found out their mothers and fathers are brothers and sisters. I am assuming this is an ancestry match? My brother matches CC on chromosome 20 only, at 8,942,281 to 17,622,971. His daughter matches CC on chromosome 20 only, at 8,942,281 to 17,559,399. Gedmatch matches him at 16.9cM, 2035 SNP and her at 15.7cM, 1876 SNP. My data is almost exactly the same as my brother’s and we get similar results to a 4th cousin of CC. Ancestry removes some matching areas that it deems population specific due to pile ups. If Ancestry thinks that part of the segment is unreliable, why is it deemed to be reliable for the daughter? He matches me at 7.1cM Ancestry, 14.0 FtDna, 16.9 Gedmatch. My grandfather’s closest ancestry.com match says “1st cousin” 940cMs over 35 segments. Their ages and trees leads me to believe they are true 1st cousins and other matches verify they share the same grandfather. However, I cannot verify the grandmother. With this much shared DNA, I’m assuming his grandmother is also my Grandfather’s grandmother. Would that be a valid assumption based on the DNA? That is two much DNA for a half first cousin match so most likely the same grandmother. Either that or perhaps a sister of hers. Is this the wrong link? I have a question about segment size. I am helping an adoptee who has a 1st to 3rd cousin match on FamilyTreeDNA with a prediction of 2nd cousins. I have done as a “mirror tree” and know where this match fits in the tree and am trying to place the adoptee in the tree. They share 337 cM’s and the “longest block” is 129! I am wondering what you think this relationship is? They are both Jewish men who probably share the same Y-haplogroup. (one tested the Y at FamilyTreeDNA the other at 23andme.com.) Does this one very long segment mean anything significant? I have not seen this addressed anywhere! Closer relationships share larger segments. The segments from the paternal side are also always larger. A likely relationship is half 1C where the adoptee’s father is the half sibling of the match’s father. I have not seen a 2nd cousin match with a segment thst large but in an endogamous population like AJ it is possible. Wow, I am amazed at your ability to figure this out because the father of the match did have half brothers just as you predicted! However, they were much older and already dead, so could the match be a half 1C once removed? There are possible candidates for this relationship in my “mirror tree” who are the right age. The dnapainter tools lists half 1C1R as a good possibility. Further to Kalani Mondoy’s comment about the variability of size of match with more distant cousins, my brother has a match with a known half 3C1R with a total match of 139cMs, largest segment 51cMs. On Blaine Bettinger’s relationship probabilities calculator there is a 1.79% chance of this. There are always going to be these outliers. That makes me wonder about a second distant relationship adding to the results. Does that make sense? Could you have a cousin with a “high” shared cms number, but they be a distant cousin with multiple paths to your tree? Would the Ancestry (and maybe others) results just show a total shared cms and segments, but not be able to differentiate between a close match and a distant with two or more relatives? Is that what it looks like with issues with endogamy? This may require a pretty simple answer, but I guess I would like to make sure I’m looking at the predicted relationships correctly. In an unknown parent situation (yet knowing who one parent is) when looking at shared cms in Ancestry for instance, should one assume that all close relationships are half relationships, thereby skewing the DNA Painter relationships? For instance, one side of an adoptees family has been determined, and Ancestry matches divided between paternal and maternal. The father is known. The maternal tree has been diagrammed extensively, with four close dna matches in the tree. None of these matches share any matches on the adoptees paternal side, so the assumption is they match through the mother. The father nor any of his family is in the maternal tree. Do you then assume that the shared cms in these four matches should be for 1/2 relationships? I’m sorry if this is so simple. I just keep running around in circles chasing my tail. You are not the only person who has trouble getting your head around the half relationshiop thing. Only other children by another spouse of a parent are half relationships. All the others are full relationships because you fully have that parent. For example, your Dad’s brother is your uncle, not your half uncle, as long as he is a full brother to your Dad. Hi Kitty, thanks for the reply. Yes, I understand your example. It’s also because they share all four grand parents, right? I need to go back and read the 1/2 relationships articles. Ah. On my paternal side I have two half brothers, and two first cousins. They are full first cousins, not half. I am hoping that someone can give me an answer (although I fear I know a truth is coming I don’t want to accept). I tested my DNA on 23and me. My Father submitted his to 23and me. I wondered why neither of us was showing on each others relative list and requested a DNA comparison. It came back 0. Completely 0. Not one segment. Is there something I could have done wrong? Or…is my father not my father? I have no one else matching me closer than 3rd cousin on Mothers side. Mother insists the test is wrong. Anyone have any idea other than the obvious? I am so sorry for your pain. Are you sure your dad elected to share his results with relatives? You could download both sets of results and then upload to another site and compare there (gedmatch, familytreeDNA, DNA.land or MyHeritage). Just in case there is an error (very very unlikely), I suggest that you test yourself and your Dad at Ancestry as well. If your roots are American, you will likely find more matches there. Are there any relatives on your Dad’s side who might be willing to test? You could try one of them rather than your dad if asking him to do it again is a problem. How does the ancestry composition for you look? Any surprises there too? That can also give a clue. I don’t mean to bother you, but I wanted to know your opinion on the following match. My wife is trying to locate her father. We found two close matches on Ancestry.com and MyHeritage. One shares 197 cM across 15 segments (Ancestry.com) and the other shares 186.7‎ cM with 7 Shared segments, the longest at 57.9‎ cM (MyHeritage). They are both confirmed first cousins with extensive family trees. We don’t know where to go from here. I believe we can rule out at least to pairs of great grandparents; her two from her mother’s side. Do you have any suggestions on what the relationship may be with two matches? It’s never a bother, I love to help people but right now I am not very available until after the conference this weekend. Look at the relative ages of your matches as compared to your wife. Most probably these are either 2nd cousins to her or 2nd cousins once removed. So if your wife is much younger, her unknown Dad might share great grandparents with those two. Hi Kitty! I am so glad I found you! I hope you can help me answer a complicated question… I was adopted at birth with no information about my biological family other than location (Dallas). When I did my Ancestry.com and 23andme results, I come back as closely related to another woman (Mindy). We are in touch and she was also adopted and still living in Texas! We think there is a possibility that we are half siblings. We share 1,418 cM over 60 segments. We both share a significant relationship with another woman (who hasn’t responded to us) that for me is 1,903 cM over 65 segments and for Mindy 1,866 cM. 23andMe has Mindy and I listed as 1/2 sisters even though we only share 22.2% DNA. Is this possible? Does this mean that all three of us are 1/2 siblings? Thank you for any insight you can give me! Yes it is very likely that you are half sisters. You might both get yourselves 23andme kits for Christmas to find more relatives and check if you are maternal or paternal half sisters. I’m new to this DNA thing and having a lot of fun researching it. I have a few cousins and we’re all average cM’s and segments on my Dad’s side (his brother’s kids) but my mom’s brother’s daughter (my first cousin) and I have 1025.8 cM 36 shared segments and 81.5 longest segment. From everyone I talked to this is the highest I’ve come across for first cousins. I thought you typically had higher with your dad’s side? Why does this cousin and I have so much more? Are we pulling from more of the same relatives/ancestors? If we upload to GEDmatch will it tell us what ancestors we share? That is on the high end but it is in range. You have bigger segments with your Dad’s side but not necessarilly more DNA. I have just done a DNA test through ancestory and it matched me with a women. We share 1645 Cm across 40 segments. It matched us as close relatives-1st cousin. My father was adopted so I have reduced that I am related to this women in some way. Whoever, when I contacted her to try and figure out who she, she shut me down and said it wasn’t possible that we could be related. So my question is, who could this women be to me. Dna doesn’t lie so she must be of some relation to me, right? Maybe I just caught her by surprise or maybe she’s hiding something she doesn’t want me to know. She could be your aunt or niece or even your father’s mother. Now some sleuthing us in order. How old is she? Thanks for the quick response! She is 74. I am 23. My dad is 50. Going back and looking through tree she has built, she has 1 brother. Through some research I found his name. From what I know about my father’s bio mom, she was married, had an affair, and had a baby, my father. So it’s unlikely that the brother is my dads father. She gave him up and it was clear he was not her husbands(he was of mixed race) and that was that. Of course in the 60’s that was a big deal. The women I matched with has since marked her tree as locked so I cannot see it. I’m convinced she is his mother and obviously she isn’t interested in reconnecting. I’m really not either. I’m just enthralled by this whole mystery of who we are and just really wanted to at the very least know their names. If this is all I will ever find out then I guess I am okay with that. Thanks for your help and I will check the resources you have provided. 1038 cm over 43 segments came up to someone I never heard of. Any thoughts on how close this connection is? I recently came upon a relative that had 1,717 cM across 76 segments shared with me on ancestry. I have never known my father so know that this is a relative on his side since I know all the relatives on my mothers side (she has passed btw). This person cannot understand that we are probably half siblings, because the relationship doesn’t make sense to be an aunt to him or a grandparent. Am I missing another possible relationship? Hi! First off, congrats for the great blog! Not sure if this makes sense, but I have 2 raw files and I’m trying to use Excel to calculate how much DNA they share (the last 2 columns are the results for person 1 and person 2, respectively). What threshold should I use to determine that a set of consecutive rows with the same results is long enough to be considered a shared sequence? And what is a cM in this context? Is each row a cM? Or is this not a good approach whatsoever? Thank you! However, from an educational standpoint, I would love to understand how these sites scan the files. For example, I read that a “sequence” for 23andme is a contiguous region of 700+ matching SNPs and 7+ cMs. If I scan my files and I see several matching rows, and then I run into a “flipped” result (e.g. AG GA) would I stop counting and stop the sequence, or would that be considered part of it and I should keep counting? Unfortunately I haven’t been able to find any open paper that describes how these algorithms work. My bio sister and I are very close matches with a man who had been adopted and has no blood relatives. Facts show that the man is related to my deceased father’s maternal side of the family; my father was an only child. My sister, CE, has 465 Cm and 26 segments with this man, while I, MK, have 333 Cm and 23 segments with the man. In studying our chromosome similarities, CE and man share 9 segments that are length from 20-44 long. Myself, MK and man share 5 segments that are length 20-33 long. And most interesting is that the 3 of us share exact (or almost exact) segments on chromosomes 5, 8, and 11. We are trying to figure out where this man fits into our family. I’m feeling that this data is significant but I don’t quite know how. Please let me know your thoughts!! What I do is average the two sisters and look up 399 cM. Using the calculator at https://dnapainter.com/tools/sharedcmv4 shows that half great uncle would fit (your paternal grandmother’s half brother), but so would half first cousin and first cousin once removed (or half). In the latter case your father would have a half maternal sibling he did not know existed. Hi Kitty, thanks for the response. You confirmed my suspicions of the 2 possible scenarios….which is very helpful to know we r on the right track. My grandmother had 5 siblings. Of those siblings’ descendants, their dna % with this adopted male blood relative was 2.88% while another was 5.22% (which is close to my sisters and mine with adoptee). Out of both of your 2 scenarios, the first one is impossible since those ancestors had been deceased prior to 1954 when adoptee was born. The 2nd scenario is indeed possible. We are trying to get a dna comparison with my deceased dad and adoptee, however, my dad’s dna is on ancestry and ftdna and the adoptee’s dna is on 23andme, so my sister is having difficulty comparing them. Additionally, my sister has my grandmother’s old lipsticks. It was my sister’s idea that maybe the lipsticks contain some of my grandma’s dna that can be tested. What are your thoughts? Thank you so much Kitty for all your fine suggestions. I will look into them to pursue our next steps. So I’ve just done a DNA test on Ancestry, and there was only one match within 2nd cousin range. 377 cms across 25 segments. I’ve looked at the possibilities on the chart already. But I just wanted to ask your opinion. This person has a family tree with names I don’t recognise. Unfortunately one surname my grandmother did recognise. I say unfortunately because this surname is linked with a not-so-great memory from about 45 years ago. There’s been a bit of mystery as to who my mother’s biological father is, as it is out of two people. The match is “most likely a second cousin”, but I’m next to certain they are either a half-first cousin 1x removed or a half-aunt. Are either of those more probable than the other? I’ve made my mum order a DNA test and that will tell if they are her half-sister or half-first cousin, if at all. My match isn’t especially interested in knowing but she’s so closely related and next to no matches thus far have been from mum’s side, plus it might put my grandmother’s mind to rest rather than keeping her guessing. It’s a bit of a messy situation but I don’t intend on sharing this information with my mother per grandmother’s wishes. And you can see 1st cousin once removed is more likely than the others. If the brother or sister of the bad memory is the parent of your match then the match is a FULL first cousin once removed to you. The half only comes in when the person in question is descended from a half sibling of your ancestor. My bad! I’m a bit slack with the rules of basic relationships apparently. Thanks for replying so quickly. It seems 1c1r is more than likely the answer. There must have been a brother. That calculator’s great by the way.